These students have a bright future ahead of them! I had a wonderful public relations class this fall. This quarter was particularly busy with my large lecture class and work on an interdisciplinary NSF grant, among other big things, and it was always a highlight of my week to mentor this enthusiastic group and see their growth in just 10 weeks. You can see students’ infographic tips and click on the images of their infographics for a close-up view of them. Jessica Stancil created an infographic to encourage people to watch a one-minute video to learn CPR. Nicole Marlborough created an infographic for a CSR program she proposed. Marisa Blair created an infographic about the success of MTV’s Video Awards show. Lindsey Contino created an infographic about cooking safety as a bulletin board poster for her catering job. Allie Masterson created an infographic to highlight the accomplishments of the San Francisco Giants. Taylor Yacobucci created an infographic to encourage communities to support a music festival. 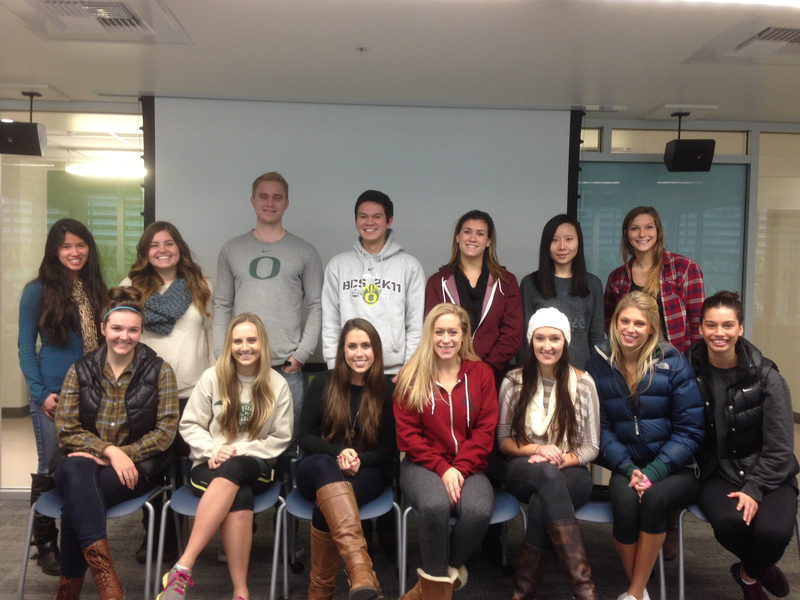 Jen Eisenmann shared tips from her informational interview with Nike’s Kayla Glanville. Bradley Sheets shared tips from his informational interview with federal speechwriter Neil Mansharamani. Ryan Lundquist shared tips from his informational interview with Megan Bauer, who is now with the Hoffman agency. Brooke Baum shared tips from her informational interview with Lane PR’s Angie Galimanis. Haoyun Zhou shared tips from her informational interview with Levi Strauss & Co.’s Ginger Liem. Kaitlyn Chock discussed social media insights based on her team’s work for Cawood. Nellie Maher discussed social media insights based on her team’s work for the City of Eugene. Tori Opsahl discussed social media insights based on her team’s work for Sixth Street Grill. Sarah Holcombe discussed social media insights based on her team’s work for The Reach Center. I teach PR classes and conduct research at UNC Charlotte. I only post on occasion to this blog due to other priorities.